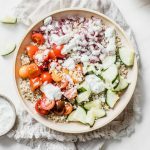 This Mediterranean Quinoa Bowl is loaded with veggies, protein and flavor and makes for a healthy lunch or dinner recipe. Place cooked quinoa in a bowl; stir in the cucumber, tomatoes, onion, and cheese and set aside. For the sauce: place all ingredients in a blender or food processor and pulse until smooth. Drizzle sauce over quinoa and enjoy!